Posted September 6, 2016 by The Rapid & filed under News. 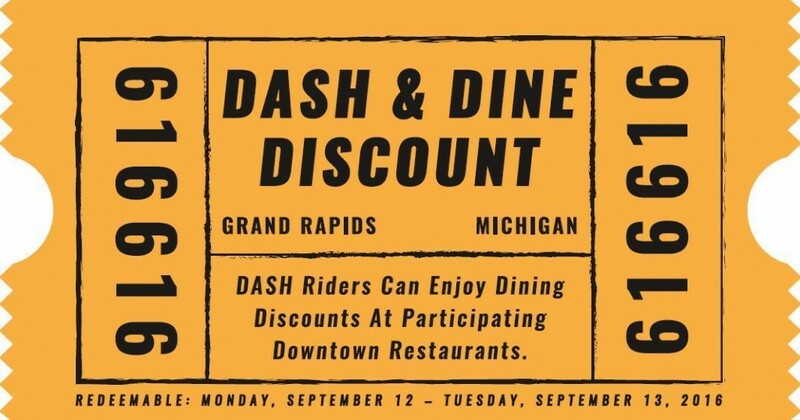 Riders who take advantage of the City’s new and improved free DASH shuttle service at least once Tuesday, Sept. 6, through Tuesday, Sept. 13, can enjoy bargain pricing on meals at more than a dozen of Grand Rapids’ most popular Downtown destinations as part of a special “DASH & Dine Discount” promotion. “We believe the “DASH & Dine Discount” marketing event is an excellent opportunity to build understanding of our expanded free Downtown transit service and inform the public that the shuttle is now available to everybody who travels Downtown,” said Joshua Naramore, Mobile GR & Parking Services Department manager. “Our goal is to help promote awareness of the new DASH benefits that clientele patronizing Grand Rapids’ outstanding restaurants and food retailers as well as the general public and even out-of-town visitors can receive every time they park Downtown,” Naramore said. Passengers who utilize DASH services at least once from Sept. 6–Sept. 13 are eligible to receive 10–20 percent discounts off their entire food purchase or other bargains redeemable at participating restaurants and retailers exclusively on Monday, Sept. 12, and Tuesday, Sept. 13. The discounts – which do not include alcohol, tax or gratuity – will apply only to customers with proof of a DASH & Dine Discount ticket. DASH drivers will provide passengers who ride the shuttle during Sept. 6–Sept. 13 with a discount ticket to present at participating merchants to receive their DASH & Dine Discount. The DASH & Dine Discount event is a partnership launched by the City’s Mobile GR & Parking Services Department, Experience GR and Downtown Grand Rapids Inc. (DGRI) to help explain the comprehensive reforms Grand Rapids introduced last week to modernize its public parking and local transit systems while making getting around Downtown easier than ever. The marketing push is spurred by results from a recent Mobile GR & Parking Services Department survey that shows more than 80 percent of Downtown’s monthly parking customers say that they have not used the DASH service during the past 12 months. Just under half of all respondents – 49 percent – say they are less than somewhat familiar with DASH services and routes, including 28 percent who are not at all familiar. The City’s messaging efforts include an updated website – www.grparkingchanges.org – featuring information tailored to specific groups of customers based on their transit and parking usage, as well as social ads, postcards that will be distributed to patrons throughout Downtown, public signage and news media coverage that encourage people to learn more about their options. Grand Rapids also is utilizing two new free mobile apps – GR Park and myStop Mobile – that cell phone users can download to instantly navigate their array of Downtown travel and parking opportunities. In addition, the City of Grand Rapids, Mobile GR & Parking Services Department, The Rapid and DRGI are teaming to create a “Park Once” district in Downtown. The “Park Once” district will allow drivers to park once and travel throughout Downtown via free public transportation. The City is increasing DASH service to create a true high-frequency Downtown DASH Circulator – a de facto Downtown Area shuttle – that complements the current Rapid public transit network. The no-fare service will run on weekdays, with exceptions on holidays. The City is consolidating service lines from the existing four DASH routes to two new routes – DASH West and DASH North – that are both within easy walking distance of all City-owned parking facilities. Beginning Thursday, Sept. 1, DASH service operation hours were increased to run from 6:30 a.m. to 10 p.m. during the week, with a frequency of 7- to 8-minute service all day long. A fleet of seven DASH buses will operate at all times to connect current City parking facilities to Downtown destinations, as well as to link all major destinations through a simple pair of routes connecting Downtown and surrounding neighborhoods. Trips on both DASH routes can be completed end-to-end in approximately 15 minutes, providing a fast, easy and convenient mode of transportation, Naramore said. Another highlight that kicked off Sept. 1 allows Downtown travelers to ride Grand Rapids’ Silver Line service at no cost, all day long, from north of Wealthy Street and throughout Downtown. Grand Rapids has not raised parking rates beyond the rate of inflation since 2000. Rates have only minimally been raised an average of 1 to 3 percent annually over the past 10 years and have not kept pace with increased demand and growing costs for providing services to customers, Naramore noted.